"I feel this is going to be our night," I said to Ben as we went down the deeply gouged gravel road that leads to fisherman's beach south of the water treatment plant alongside the Athabasca River. Fishing has been extraordinarily poor this season and of late, I have been catching more snags than anything else and losing rigs. Whether it was the unparalleled flooding of the Hangingstone River and its impact to the fish habitat, or just the natural ebb and flow of fish migration patterns, on the whole this fishing season has felt like an anomaly, a bit of a disappointment. "I hope there is nobody here," I said as we turned the final corner and got our first glimpse at the rock strewn shore below. We were indeed alone in our angling endeavours, save for the old fellow down the beach with the smoke-stained moustache and cabin-covered half-ton filled with assorted paraphernalia and a small cot. He is a regular on this beach, a Frenchman from New Brunswick who uses an interesting method of propping the top half of his rod up on a big stick with a T-joint while he waits for a fish to strike. He's the one who earlier in the season suggested that the reason I wasn't catching anything was related to the minnows I was using. Smart man. Turns out he was probably right. I switched minnows and things started to pick up a little. Ben likes to tag along with me to this particular fishing spot, not to fish, but to explore the treasures of the beach. 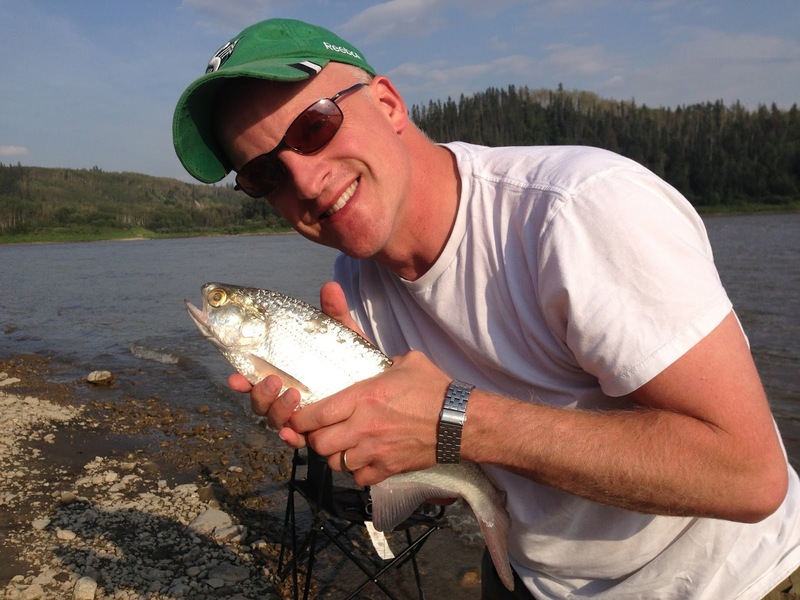 In terms of looking for exotic rocks and fossils, there is no better spot in Fort McMurray. And with elevations constantly changing on the Athabasca owing to mountain snow melt or rains down south, there always seems to be a new collection of exposed rock to explore. If you're ever bored with your kids on a hot summer day, this is a great spot as they can also safely wade into the water without fear of being swept away. I set my first hooks as Ben happily meandered. Within minutes I was snagged and lost both my pickerel rig and a new three-ounce plastic covered ball weight. Damn! Taking a different approach, I threaded an egg sinker, ran it about 18-inches up the line and secured it in place with a slip shot. 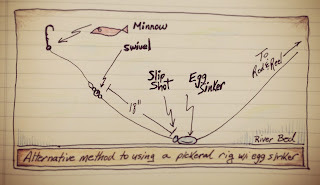 Tying the end of the line to one end of a swivel, I brought out a single pre-strung hook and slipped its loop through the other end of the swivel, then locked it in place by running the tethered hook in and through. 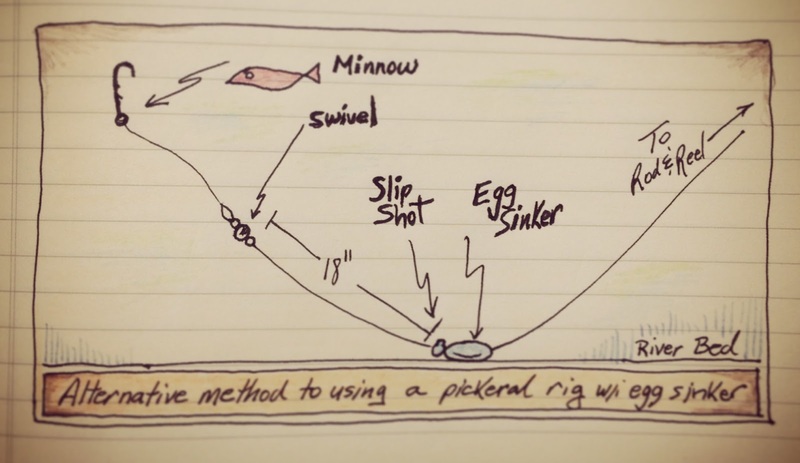 Using this method, the sinker bounces along the bottom of the river, while the hook and bait float 12-18-inches from the rocky riverbed. Because the line is slipped through the egg sinker, you can feel every single nibble, hit or collision with the myriad rocky obtrusions that lie on the bottom of this majestic river. Almost immediately upon switching to this alternate method, the bites started happening and within minutes I had something on the line. With the current and the body shape of the goldeye that was making a beeline for the shore, it was hard to tell if I actually had anything, that was until he broke the surface of the water and took an impressive leap in the air. "Ben," I called. "Grab my iPhone and get ready to take a picture." It was probably the largest goldeye I had ever seen, making me question, if only for a second or two, that it might be some other variety of fish. 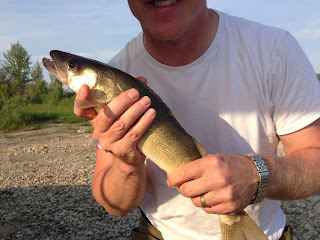 The evening included a 45-cm walleye, another goldeye, and several fishing treasures that we manage to successfully snag including lures, rigs, and weights. It was a lucky night. "Maybe you should go buy a lottery ticket," suggested Ben as we packed up to head home. "That's probably a really great idea."